Mine: Great story on several levels. Fun as a love story. Fun as a period peice. Fun as a look at the world of the theatre. It so deseved the best picture. Better every time I see it. 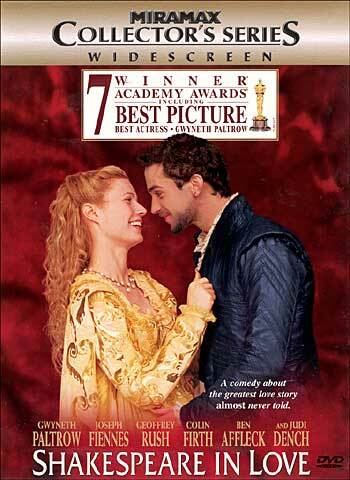 Leonard Maltin/Plot synopsis: Spirited, entertaining speculation about a love affair that inspired William Shakespeare (Fiennes) to write Romeo and Juliet. Witty, sensual, and peopled with colorful characters. Climactic performance in the 16th- century theater is as vivid a re-creation of theatergoing in Shakespeare's time as anyone could hope for. Screenplay by Marc Norman and Tom Stoppard. Rupert Everett appears unbilled as Christopher Marlowe. Super 35.